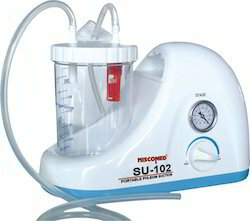 Wholesale Trader of a wide range of products which include pedal suction, hand suction, trolley model suction, portable phlegm suction , model no.su-102, askir c30 suction unit and suction apparatus. 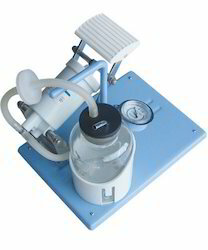 Pedal Suction offered by us is primarily used in hospitals of all levels for suction of phlegm, blood and other thick liquid during surgical operations and induced abortions. Due to its compact size, lightweight and trouble-free operation and it particularly fits for being extensively used in rural clinics, no power area, homes, remote areas, and other emergency occasions. 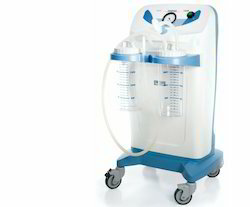 Our organization is top-notch organization which deals in presenting Electric Suction Unit to our patrons. Offered in powder coating of premium steel chassis, this Electric Suction Unit has been developed in a precise manner and is attached with long pressure tubing and vacuum control. This offered unit can be custom-made according to preference of our prestigious patrons. Last but not the least; this offered unit is available at nominal price. Our offered Portable Phlegm Suction is innovatively designed oil-free lubrication pump widely known for large flux, high negative pressure and low noise. It is especially designed for absorbing thick liquid such as phlegm, blood etc. 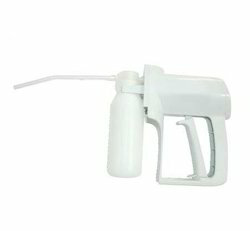 it is not only used as suction device in emergency room, operation room, but also at home as health care product. 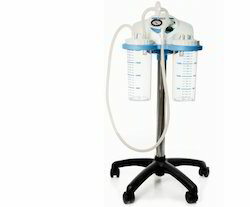 ASKIR C30 BR is a portable suction unit for the aspiration of body liquids, oral, nasal and tracheal aspiration in adults or children. 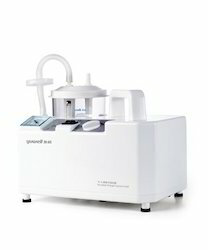 For professional use and with a powerful aspiration of max 36l/min. ASKIR C30 BR comes with double collection jars and on a stand with five castors for easy transport. Two different option for operation, AC/DC adapter, rechargeable battery make it a versatile suction approved for NON-STOP operation without overheating. Provided with visual and acoustic alarm indicating low battery level, the main unit is also equipped with vacuum-meter (bar & kPa) and vacuum regulator. Since our establishment in this industry we have maintained a sturdy foothold in the market due to our unbeatable quality and tailored array of Trolley Model Suction. Highly acknowledged and accepted across the industry for their premium quality, longer service life and excellent quality, these offered products are highly recommended and demanded. Apart from this, we are presenting them to our patrons at highly feasible costs. 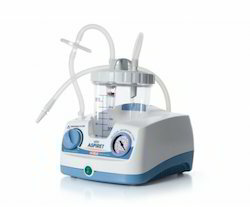 NEW ASPIRET is a desk-type electric Suction Apparatus for the aspiration of body liquids, oral, nasal and tracheal aspiration in adults or children. Suitable for tracheotomized patients, minor surgical applications and post-operative therapy in home-care. Main unit equipped with vacuum-meter (bar & kPa) and vacuum regulator.Complies with EN 60601-1-11 “for use in the home healthcare environment” and carries IP21 degree of protection. NEW HOSPIVAC 350 has been designed for professional aspiration of bodily fluids, gases, tissues or bones of the patient during or after surgery. 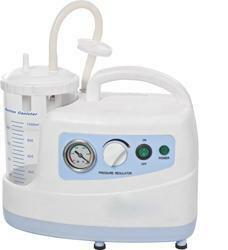 The state-of-the-art oil less pump guarantees high performances with excellent suction capacities and max vacuum reachable within a few seconds, with no need for maintenance.A clear dashboard along with a full range of accessories makes it the ideal device for surgical suction and liposuction.